The 1,515-mile Florida Circumnavigational Saltwater Paddling Trail (CT) has been busy lately with long-distance paddlers. The first kayaking family to attempt a thru-paddle began Jan. 3, from Big Lagoon State Park. Calling their life journey, "Adventures for Change," Melissa and Jeremy Howard and three of their children, ages 8, 11 and 13, plan to finish in June. They are supporting a different charity for each of the trail's 26 segments they paddle through and they plan to keep an ongoing blog. The family runs a kayak tour company in Southwest Florida. Aaron Carotta, otherwise known as Adventure Aaron, stopped at Big Lagoon on Jan. 4 during a canoe journey that started five months earlier in Montana. He plans to continue paddling along the Gulf on the CT and is not yet sure of his ending point. He paddles in support of the group "I'm Adopted." Scott Warren began his journey on Oct. 30 at Big Lagoon and is currently in South Florida. Several other paddlers are scheduled to start the trail or are completing it in segments over time. You can learn about these paddlers and more at the annual CT Trail Reunion April 21-23, at Wekiwa Springs State Park. The Florida Paddling Trails Association (FPTA), in cooperation with OGT, hosts the annual reunion to celebrate tales from this season’s CT thru-paddlers and show appreciation for statewide volunteers and to those "trail angels" who assist long-distance paddlers. The reunion is a blast and not to be missed! You must be an FPTA member to join the fun and receive free park admission, cabin accommodations, a great paddling trip down beautiful Rock Springs Run, dinner and breakfast, and a chance to meet and mingle with lots of fun paddling friends. Those wishing to attend should contact Doug.Alderson@dep.state.fl.us. Embark on a Real Florida Adventure! The Real Florida Guides, formerly called trail itineraries, can now be found on the Florida State Parks website. Created by OGT, each Real Florida guide focuses on outdoor recreation, history and culture within a 15-mile radius of a chosen site. Each hub is either a state park, town, small city or rural region and features camping options. The goal is to promote extended stays by featuring multiple trail opportunities and points-of-interest. Locations range from Topsail Hill Preserve State Park in the Panhandle to White Springs in North-Central Florida to Lake Kissimmee State Park near Lake Wales. There are also six guides that are part of the Wish You Were Here theme, featuring state parks that were once Old Florida tourist attractions. The Palmetto Trail, an approximately 1-mile multi-use recreational trail located within the 20-acre Palmetto Estuary Park on the north shore of the Manatee River, was recently completed. The Palmetto Trail is a section of the 260-mile Southwest Coast Greenway Trail, a Florida Greenways & Trails System Priority Trail stretching from Pinellas County south to Collier County. Work has begun on paved, multi-use trail projects that are part of the Shared Use Nonmotorized (SUN) Trail program, managed by the Florida Department of Transportation with planning assistance provided by the Office of Greenways and Trails (OGT). A total of $44,434,543 was awarded for 45 separate projects located across 21 different Florida counties. Twenty-two of the projects will help advance two major regional trail systems selected as priorities by the Florida Greenways and Trails Council: the 250-mile Florida Coast to Coast Trail and the 270-mile St. Johns River-to-Sea Loop (SJR2C). 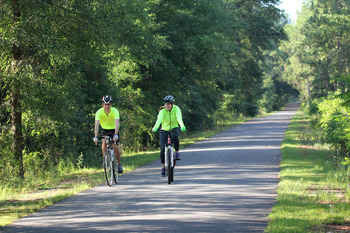 The Palatka-to-St. Augustine State Trail is part of the SJR2C and two trail construction projects are currently underway. A new alliance has recently been formed to support the SJR2C trail efforts. Twenty-three SUN Trail projects are for individual trail segments throughout the rest of the state. This includes a bridge project on the Withlacoochee State Trail and a 5.5 mile extension of the Palatka-to-Lake Butler State Trail to the town of Palatka. All of the trails are part of the priority trail network, coordinated by OGT. 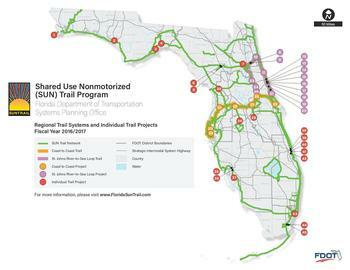 The SUN Trail Program was established during the 2015 legislative session. 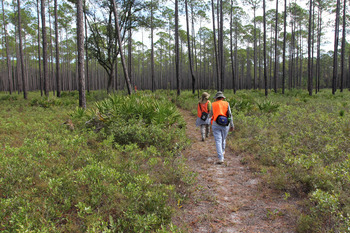 Celebrate Florida Hiking Trails Month! The weather is often cool and crisp this time of year, so it's time to lace up those hiking shoes because February is Florida Hiking Trails Month! Florida boasts more than 2,500 miles of hiking trails that are open to the public, in addition to 4,680 miles of shared-use trails that are also available to hikers. Hiking opportunities in Florida include the 1,100-mile Florida National Scenic Trail, one of only 11 congressionally designated National Scenic Trails in the U.S. The Florida Trail Association is Florida's volunteer organization for developing and maintaining hiking trails throughout the state. Every dollar spent on biking and walking trails saves approximately three dollars in medical expenses (American Heart Association). The color green makes exercise feel easier and people are more likely to exercise more often (Environmental Science & Technology). Green outdoor settings reduce ADHD symptoms in children across a wide spectrum (American Journal of Public Health). Getting outside on a daily basis can help senior citizens stay healthy and functioning longer (Journal of Aging Health). Walking can boost creative thinking (Journal of Experimental Psychology). People who live near safe, high-quality biking and walking infrastructure tend to get more exercise than people who don't (American Journal of Public Health). Many researchers believe the outdoors simply makes us feel happier! If you are a public provider of outdoor recreation in Florida, you can help shape the next Statewide Comprehensive Outdoor Recreation Plan (SCORP) by taking this brief, online opinion survey. SCORP is a five-year policy plan that guides the development of a diverse, balanced, statewide outdoor recreation system. Florida’s SCORP documents our recreational supply and demand by describing current opportunities, estimating needs for additional opportunities and proposing means for meeting those identified needs.